Also named Jigu, this specie belongs to Pleurotus, Pleurotaceae, Agaricales, Hymenomycetes, Basidiomycetes. Branched oyster contains abundance nutrient composition, for example protein, sugar, fat, vitamin, Fe and microelement. Amino acid content is higher than that of vegetable, contains eight human necessary amino acids. The context are thick, tender. It has favourable taste and healthful effects. It is the most popular oyster. There are lots of strains in production at present, and the Japanese strain, which cultivated in our province, now is more ideal strain. Hypha of Branched oyster growth is bloom, and there are many suitable substrates for cultivating. It contains common straw, wheat straw, cotton seeks bull, sawdust etc. keeping C/N at 20-30:1 to prevent hypha growing egregiously. The medium formula is : Cotton seed nut 50%, sawdust 30%, wheat bran 15%, corn powder 3%, sugar 1%, CaCO3 1%, KH2PO3 0.3%. The fruit body fruiting phase is short in every flash. The nutrient composition expenditure is low, and the flush is short, too. So the whole cultivation stage pulls long very much, and it is 6 months at least. At area which air temperature is low it may be last 10 months. In order to sufficient using the nutrient of the mediums the temperature of spawn running phase don’t exceed 25°C. The scheme are arranged base on the adopted strain, air temperature and production condition. Adopting indoor bed cultivation or outdoors shed cultivation. Indoors bed cultivation refers to the stacking method in Negraudia reymaudiana cultivation. Outdoor shed cultivation adopts ridge cultivation or stacking cultivation. The cultivation place is on high site, faced the south and using water and draining easily. Keeping off pollution resource. Creating an ecosystem benefit to hypha growing and disbenefit to germ growing. Adopting the processed substance bag cultivation. It can short the flush. The structure of cellulose and lignin is changed after high temperature sterilization. 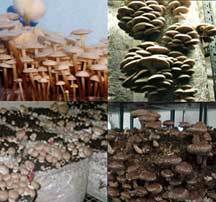 It is benefit to mycelium decomposing, absorbing, utilizing. According to the formula weighing the substance. Moisture content is about 65%. The bag is 17×33 cm polypropylene bag. Filling 300-400 gm dry substance in the bag, sterilizing by high temperature steam. It is best to do that filling and sterilizing intraday. The temperature rises 100°C, keeping stability and maintaining 14-16 hours. After sterilizing, cooling. When the temperature is under 28°C, inoculating according to inoculation operation demands in time. Spawn running in running room at 25°C after inoculating, keeping away from the ray. After impregnation in the running room the suitable temperature, humidity, ray, aeration induces, the hypha come into physiology maturation. It takes about 7 days. Put the bags into mushroom house, stacking on bed like the wall. It is five bags high. It is difficult that the button form when the temperature is lower than 15°C in the house. When the temperature is higher than 30°C, taking aeration to cooling down. It is effective to taking aspersion and atomization, too. Don’t atomizing into the bag otherwise the button yellow and die. At the same time, it is taking aeration to refresh the air. On stage of the hypha coming into physiology maturation and recreation, enlarging temperature difference. And cooling the temperature of environment to 5-10°C. Giving definite scatter ray to let the hypha of the mediums surface down so that adequately induce to primordial. Making every effort to decrease temperature difference and humidity difference. Keeping the temperature on 18-24? and humidity on 85-90%. Spraying three times every day. When the water accumulating on the surface of the medium, dry or pour out in time. When the button grows like a peanut, the humidity can undulate 75%-95%. In this range, the temperature and humidity are higher in this range the fruit body grow thicker. Ridge cultivating, the ventilating windows open 5 cm high in day and open 10-15cm high at night. Indoors cultivating the ventilating windows open full, at night and open half in day. So that the temperature and humidity of cultivation environment are higher in day and those are lower at night. The familiar competitors contain Trichoderma, Penicillium, Mucor, Streptomyces and Neurospora sitophila etc. Discovers can using 0.5-0.7 cm wood rod or iron rod, in the contaminative bags on all sides and firm 5-7 deep bore of cm, then press the bags originally the form line up to rise, when the outsider environment term is in keeping with, through educating of 3-5 days assesses, normal mycelium just start running the compost , again over the hair of 10-15 days assesses, bags full become pure. The familiar competitor is Myxomycete. The polluted cultivation bag is disposed when discovering Myxomycete. At the same time strengthening aeration. The familiar pests contain slug, snail, Drosophilidae and Phorids. Using the 25 ppm Turbair permethrin solution to prevent. Atomizing before fruiting or after harvesting. Don’t atomizing the fruit body. The product is primarily exported. Its quality is demanded highly. In general, pileus diameter is under 2 cm. It is the most suitable time to harvest, when fruit body only forms and before the fruit body elongate fully. At the same time batch collecting in time to improve the fine product yield. After one flush cleaning the medium surface for the next flash. It is six flashes in a cultivation period. The general biological efficiencies can achieve above 100%.